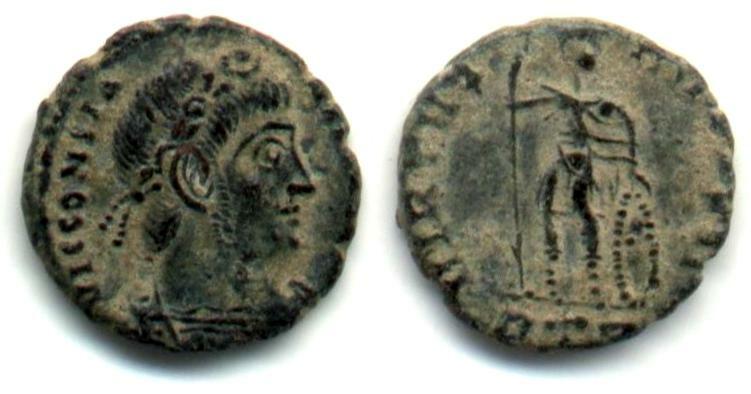 Minted in Rome between 337 and 340 A.D.
Kent, J.P.C., "Roman Imperial Coinage", Vol. 8 (RIC), Rome, p249, nr. 4, variety with RTP instead of R leaf P mintmark? Sear, D.R., "Roman Coins and their Values" (RCV 4th Revised Edition), p333, nr. 3957, variety with RTP mintmark? Carson, Hill, & Kent, J.P.C., "Late Roman Bronze Coinage", Part I, p15, .nr 580, with RTP instead of R leaf P mintmark?